Many people think weight loss and fat loss are the same thing when, in fact, they are not. Two people can weigh the exact same amount, but one can have a much lower body fat percentage than the other. Blame genetics, your lifestyle or just bad luck, but the truth is that you can be a healthy weight with more body fat than you want. BIObind Fat Binder, a United Kingdom import, is trying to help those who are looking to reduce their fat. Is their unique formula doing the trick? 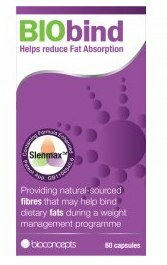 BIObind Fat Binder has a specially-advanced formula called Slenmax which is a combination of three highly active ingredients—cactus extract, chitosan and psyllium. Cactus extract comes from the volcanic area of Mexico and has been around for more than 12,000 years as a healing plant. It was even thought to have the ability to prevent scurvy by fifteenth century explorers. Cactus extract is full of both soluble and insoluble fibre which absorbs toxins and water and plays a huge role in keeping your digestive tract functioning properly. But when it comes to fat burning, cactus extract helps prevent the quick absorption of sugar into the bloodstream while digestion is taking place. And as the blood sugar level is lowered (as well as lipids), the risk of developing symptoms of metabolic syndrome is also decreased. Not to mention, all this fibre will leave you feeling full and eliminate your urge to overeat or binge. Chitosan also has a decent amount of fibre—twenty to thirty grams. It comes from shellfish and has been shown to help reduce fat and lower bad cholesterol. Its main role is to be a fat blocker as it absorbs fat molecules and fat intake up to thirty percent. Psyllium is the husk that comes from plantain seed. Its primary use is for intestinal health and controlling weight. Like the other two ingredients, it also contains fibre and helps to keep your digestive system functioning properly as well as cleansing it out. The recommendation is to take no more than six capsules per day—one or two with each meal. The amount that you take is dependent on how high in fat your meal is going to be. One bottle of sixty capsules costs $25 (£14.95). The product’s website gives a decent amount of information regarding the three main ingredients and what each one is meant to do. 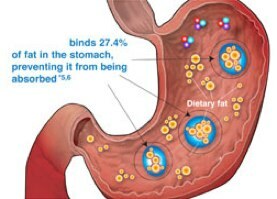 There is also a fair amount of scientific information on how BIObind Fat Binder was developed by pharmacists and nutritionists. It also encourages eating a healthy diet and including exercise. The price alone is a reason to really think about using this product. Sixty capsules may seem like a lot in one bottle, but if you are using the maximum six capsules per day, you are going to run out every ten days. And at the price for one bottle, you are going to possibly lose more money than fat at this rate. While there is nothing harmful about the ingredients themselves, there is also no overwhelming evidence that when these three natural ingredients are mixed together that they actually do what the manufacturer claims it should—burn fat. Yes, fibre is filling which means you may eat less because you feel full, but it may not necessarily burn fat at the rate that is suggested on the product’s website. Aside from that, there is no money-back guarantee if you do not like the product. Many other fat burners offer some type of guarantee for customers who are not completely satisfied. Perhaps, BIObind is not as confident in their product as they sound. The manufacturers would also be a lot more convincing if they had some customer testimonials (rather than a few random reviews) that included before and after pictures of men and women who have used the product with success. Will anything bad happen to you if you take BIObind Fat Binder? Probably not. But there is no guarantee that you are going to lose lots of fat either. No studies or clinical trials are offered to show any real proof that the product will burn loads of fat from your body. The website does offer some warnings for those taking medications or are unsure if taking the product is right for them. But in the end, even a green light from your doctor is no indication that you will lose a ton of fat—or any fat. You can certainly try the product without having to worry about serious adverse effects, but with so many other fat burners on the market with more research and customer success stories, you have lots of other choices that may end up serving you better for your fat loss goals. Binding fat is an effective mechanic of action but our preference of for Garcinia Extra – a natural slimming pill that contains Garcinia Cambogia and Raspberry Ketone. These are two of the most effective natural fat burners in existence that can also help you to prevent the formation of new fat cells.